Old St. Bridget's Church (renamed St. Brigid's) on North Pleasant Street viewed during the process of remodeling. From 1925 to 1927 (after the new church building was constructed) it was called St. Brigid's Hall. It was then sold and remodeled into apartments and renamed Cathedral Apartments. Also visible are the houses on each side of the building. Note the horse and wagon parked nose to nose with the automobile. 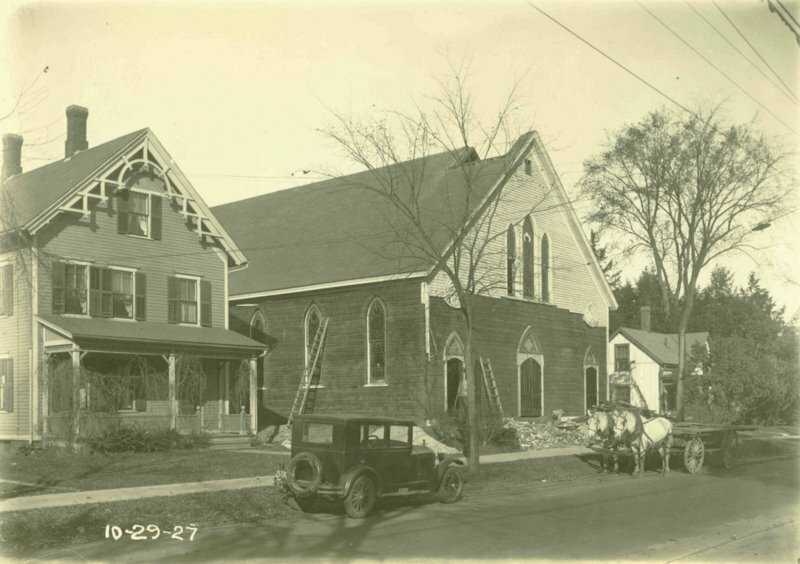 Barnes, Lincoln W., 1879-1966, “Remodeling of old St. Bridget's Church in Amherst,” Digital Amherst, accessed April 23, 2019, http://www.digitalamherst.org/items/show/789.